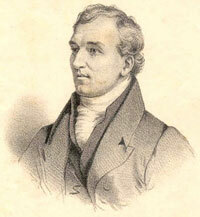 Young Scottish botanist David Douglas, having done impressive work in England and the Northeastern U.S.A, was sponsored by the Hudson’s Bay Company to collect and chronicle specimens in the Oregon Country (aka Columbia). On April 20, 1825 he arrived at Fort Vancouver. The rest of the year he made short trips up and down the Columbia, Willamette, Chehalis, and Cowlitz rivers and along the Washington coast, observing and collecting plants, preserving a few animal specimens, and collecting geological samples. In 1826 he traveled further, spending the summer east of the Cascades. He visited the Spokane and Snake Rivers, Kettle Falls, the Blue Mountains, and the Umpqua River. In 1827 he returned to England. Many of his specimens, sent by ship from the Columbia, had already reached the Horticultural Society, and he was met with great acclaim. As a result of Douglas’s collections, salal, red flowering currant, Oregon grape, and other Northwest plants soon populated gardens in England and eventually throughout the world. Douglas fir trees planted from seeds he collected still stand in England and Scotland. “Doug fir” and other trees Douglas introduced (which include the ponderosa, western white and other pines, several true firs, and the Sitka spruce) have become commercially important not only in their native habitat but in Great Britain and many other countries. He made two more trips to the Columbia River, but died tragically and mysteriously in Hawaii in 1834 at 35 years of age.